Come on down to ButlerCon 2102 at the Whitesprings Resort. I just popped into the Whitesprings Resort in Fallout 76 to grab a screenshot of something, but wound up spending a lot more time there than I planned. 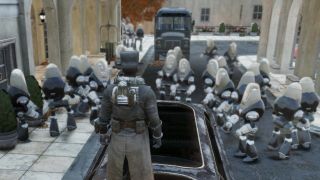 As you'll see in the pictures and video below, a glitch spawned a gazillion robot butlers and gardeners both inside and out. I know it's Cyber Monday, but this is ridiculous. If you haven't played Fallout 76, The Whitesprings is a big hotel (based on the real-world Greenbrier Resort) with lots of rooms and shops and a considerable number of robots patrolling the grounds and hallways. But there shouldn't be quite this many of them. I don't know what the cause was, but it first occurred to me something might be wrong when I ran past the hotel bellstand and saw seven robo-butlers clunking into each other behind the desk. Typically, there's just one. Things got more crowded at the hotel check-in desk, where the two robots on duty were joined by... well, there were enough that it made it difficult to count since they were all clipping around inside each other. At least a dozen of them. Sensing an opportunity, I ran into a few shops, thinking maybe there would be multiple vendors behind each cash register, perhaps each with their own stash of the paltry 200 caps that makes selling things for profit nearly impossible in Fallout 76. Alas, the unique, named vendor robots of the Whitesprings hadn't been duplicated, just the interchangeable hired help. As I stepped outside, doorman bots began spawning in at an alarming rate until the driveway was packed with them. Dozens of Mr. Gardener bots packed the sidewalks, each greeting me as I ran past. More butlers clogged up a side entrance, and a sunken stairwell was jammed with gardeners trying to get in the door. I ran around for a while, eventually attracting the attention of a couple of ghouls who hadn't been smart enough to clone dozens of copies of themselves. They were quickly overwhelmed by the onslaught of duplicated tin butlers and nannies. Eventually, as you might expect when there are ten extra robots for every one robot, and there were already several dozen robots to begin with, my game began to grind to a halt, moving from interior to exterior began taking over a minute, and I had to bail on the server. I hope ButlerCon went well for any other players who happened to stumble across it.